"Oh no…one more Padmaavat article. That too so many days after the movie’s release" - I can practically hear you say that aloud. Maybe I am crazy, but I have no option other than to share my story with you before I go completely mad. I might also end up driving you crazy in the last section of this post. Don’t say I didn’t warn you. My story involves a bizarre paradox - a moral dilemma of sorts. It all started when I watched the film Padmaavat on the second day of its release. I loved the film. The climax choked me emotionally and this was the only time in my life where I wished I had seen a movie in 3D because those glasses could’ve hidden my tears at the end. That’s how much I loved the film. Putting aside the discussions about gender politics, Jauhar or the Hindu VS Muslim trope that’s been doing the rounds, the film and the climax appealed to me at a very basic level as a triumph in tragedy – where you feel sad that the good guys die at the end but also feel happy because they somehow end up looking heroic and victorious – like Jack in Titanic. 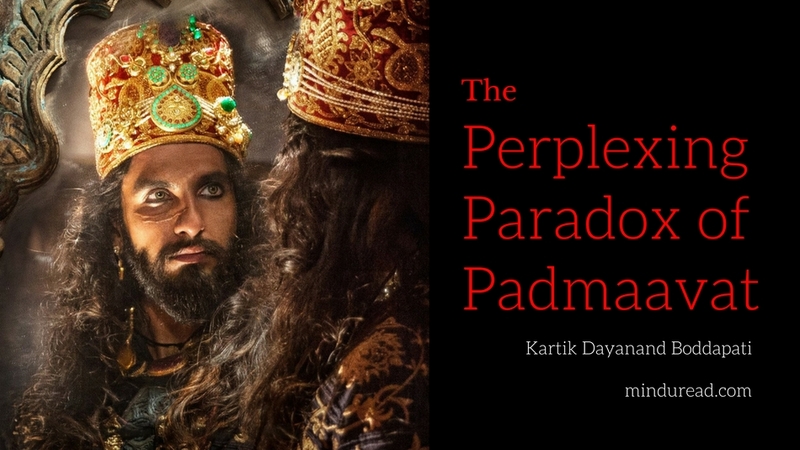 At the core Padmaavat is a story about a clash of values! Maharawal Ratan Singh’s culture dictates his values. He is bound by its rules, like Kattappa from Baahubali. His decisions might look stupid and impractical at times, but that is how he functions. Rani Padmavati isn’t as rigid as Ratan and doesn’t mind bending some of those values as the situation demands. We are shown ample instances in the film where she displays these traits. She is sorted in her mind. Sultan Alauddin Khilji on the other hand has a calculative and cunning mind along with a heart that is passionate and relentless. A deadly concoction forming his value system – a non-existent one at that. There is only one rule of war for him and that is victory (at any cost). Throw all of them together and that’s the story of Padmaavat. 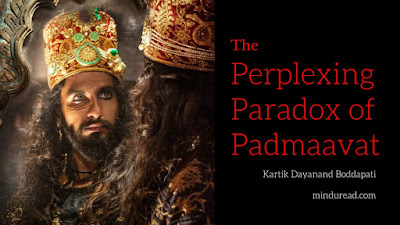 Ratan lives and dies sticking to his values – no compromise, no matter what, Khilji should never see Padmavati. Padmavati lives and dies sticking to her values - her victory lies in denying what Khilji’s heart desires. It’s her choice of what I call a triumph in tragedy. That’s where the high point, the vindication and moral victory lies for the audience too by upholding a value system we think is right - by denying what Khilji seeks so desperately throughout the movie. Justice we believe is served. That’s when the tears happen. And the ensuing stupendous box office collections are nothing but a validation of that sentiment. If even one of them skewed a little bit in a different direction the outcome of the story would’ve been very different. All sounds good. What’s my issue then? I have a confession to make. 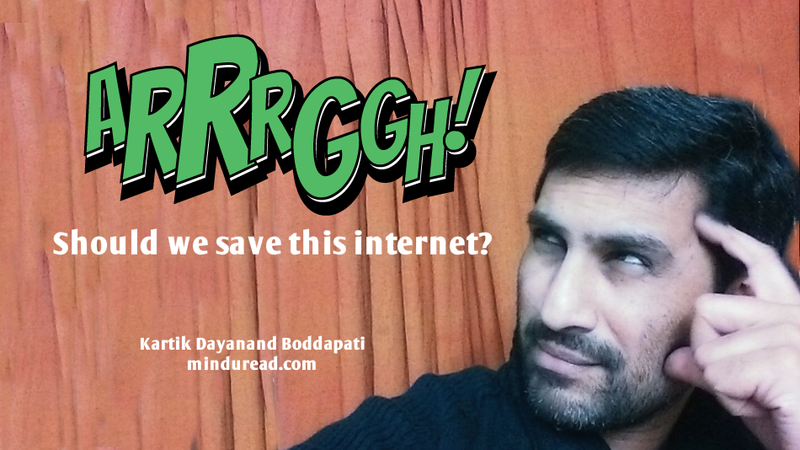 This is not the Baahubali blog post I originally planned to write. The real one is still lying in my drafts folder...since July 2015. 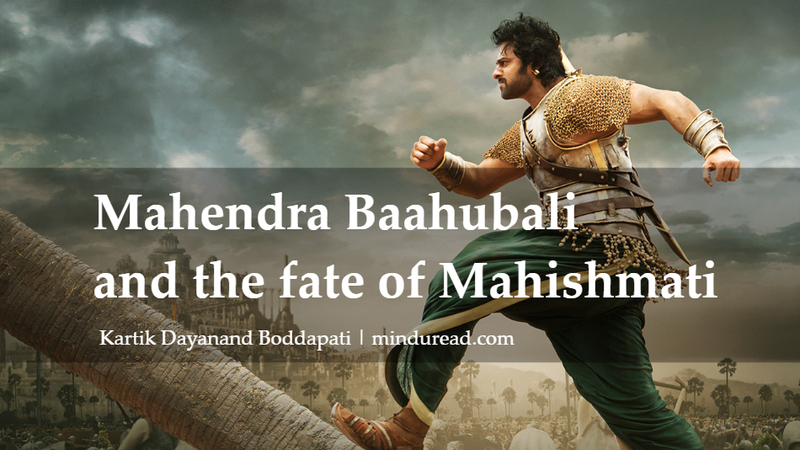 It still remains there because of a strange phenomenon with the first Baahubali movie. After every viewing of ‘Baahubali: The Beginning’ it seemed exponentially better than the previous viewing (yes, I watched the movie a lot of times). By the sixth viewing or so I started feeling like Neo from the Matrix – seeing details, patterns and threads that weren’t easily visible earlier. At one point of time I started maintaining an excel sheet to capture the complexity and intensity of thoughts that started hitting my mind. My blog post started looking like a PhD thesis, and I somehow never managed to publish it till date. Fast forward to 2017 and we already have the second part ‘Baahubali: The Conclusion’ out. Things are a bit different this time though. I don’t intend to write a thesis on the second part nor revisit my earlier draft yet, but there’s a critical observation that I wish to urgently share with you all. 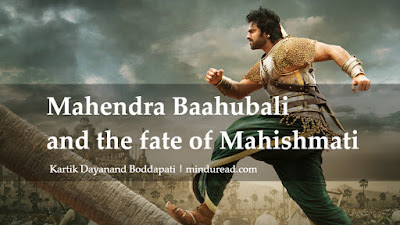 It concerns Junior – Mahendra Baahubali aka Sivudu/Siva, me, Rajamouli and the future of Mahishmati. More than a regular blog post about the entire movie, you can treat this as a quick conversation starter – a tangential take on a particular aspect of the film. 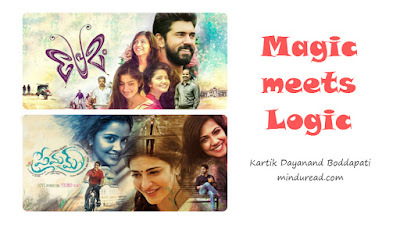 I watched the much talked about Malayalam movie Premam earlier this year, almost a year after its theatrical release. Though I didn’t understand a word of the language, I instantly fell in love with the film. Maybe it was the music, the locations, visuals, acting, chemistry, love, pimples, Java, or god knows what…the film was pure magic! Later, I came to know it was being remade in Telugu, my native language. I felt it was a bold move, maybe a stupid one too...Premam is a piece of ART, and ART is sacrosanct, not to be tampered with. Were the makers committing blasphemy? To find the answers, I waited with bated breath for the Telugu release. Caught the film during the first weekend, and then the unexpected happened. I walked in expecting to see a ‘copy paste remake’ but what I instead got was an ‘upgraded version’ of the original. It felt as if the original Premam was put on a treadmill and made to lose all the flab, in place of which it grew muscles – muscles called LOGIC. It was a given that the director would make changes to the film to suit sensibilities of the Telugu audience, but he also added extraordinary depth to the narrative – tying up loose ends, giving meaning to seemingly random occurrences, expanding the canvas of the film beyond its confined settings, including the angle of parents into what was a one dimensional narrative from the hero’s perspective in the original. The soul of the film remained intact but the structure and the interpretation of the soul now had far more weight and logic than the original. If someone were to remake the film in another language now, they would have to without fail refer to the Telugu version as the starting point. This fact shook me to the core. It actually turned my world upside down. Isn’t ART an absolute…how can we have VERSIONS of it? Wasn’t the original film perfect as a piece of ART in itself? Is the concept of ORIGINALITY overrated? These were the big question that ran on my mind. I searched for answers. Introspected. Spent sleepless nights pondering over it. Finally, I found the answers. I found them as parallels in some real life scenarios, and in the most unexpected of all places – the movie itself. That’s what I am going to talk about next. Sorry to disappoint you if you were expecting a detailed review of the film; that definitely warrants another post. I shall begin with the real life parallels first and then the movie. Once you are done reading, do let me know what you think; shall wait to hear from you. Over the last few weeks Facebook has been bombarding me with notifications that my friends support the Free Basics platform. Then started the circus about how bad this is for all of us, with most people showing their concern on various platforms, by sharing videos and articles mushrooming by the minute, all trashing the Free Basics platform. In their opinion, internet is a democracy that shouldn’t be tampered with. They say Facebook is acting as a gatekeeper, a dictator, building an internet that is a silo of the larger internet, furthering its business interests in the garb of doing social good for an unsuspecting audience. According to them, Facebook is nothing short of an evil imperial emperor. Forget the ‘about to be taken’ bit; in our case not many realize that the head is already gone while we are busy fighting over the beard. 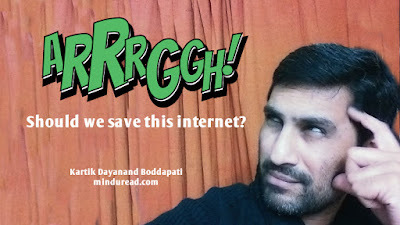 Must be obvious by now - the beard is the ‘save the internet’ campaign, and the head is nothing but the internet itself. To make sense of why I say that, we need to objectively look at where the internet of today stands. Once we do that, it will be clear as to why I make that ‘cute’ comment. You can reserve your outrage till you finish reading this post. Once you are done, I would love to hear what you think about the head and the beard too. Government says it’s harmful. Nestle's been saying it’s safe. I was home alone, and hungry one night. A pack of Maggi stared at me from the kitchen shelf. Not knowing what to do, like a new age selfie kid (am I really one? 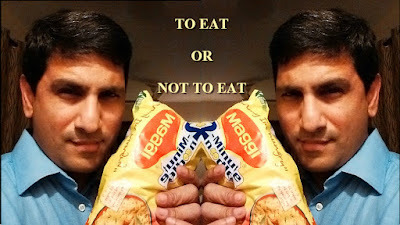 maybe) I asked folks on Facebook to help me decide – to eat, or not to eat. The answers were many. Some serious, many in a lighter vein, but all of them set to certain patterns. Patterns dictated by how seriously they took the threat of Maggi having an impact on my, or for that matter anyone else’s health. If I were to classify the answers into 4 broad categories, this is how they would seem. Pattern 1: Risky for your health. Don’t eat it. Pattern 2: You’ve been eating this for ages, nothing happened till now. Eat it. Pattern 3: You’ve been having worse. For instance Delhi air pollution. You are doomed anyways. Pattern 4: It is all media hype. Government might be corrupt too. Eat it. The results seemed inconclusive. There was no singular truth. What I instead gained from that post was a very valuable insight into the nature of truth, and what goes around it. I would like to share the same with you, especially since our perception of truth seems to have a profound influence on our behavior. PK meets Interstellar: No space for ignorance! What is this Dancing Car? That was one question my son was repeatedly asking while we were watching the movie ‘PK’. Though old enough to grasp basics of the world around him, the concept of a dancing car in ‘PK’ was alien to him. No wonder, the child’s curiosity kicked in and the above question followed. There was no convincing answer to give him. Similar is the state of PK, our alien from outer space. His childlike curiosity constantly questioning the world around him; learning answers the hard way – much to his bewilderment and our amusement. PK questions many aspects of our world, but there is one thing I am particularly keen to explore further - the conclusions he arrives at during his quest to reach god. God exists, but a medium (religion & rituals) and messenger (god men) to reach god are unnecessary. Is PK right in saying so? Maybe…but his childlike innocence can’t be a good enough reason to completely believe him. How can we be certain that he is right? Maybe he didn't meet the right people who could answer him; or maybe it wasn't time for him to know the answers yet, just like the mysteries of the dancing car for my son. Don’t know what you think, but I believe there should be no space for doubt or ignorance in our minds when it concerns such matters. There is another movie from the recent past which set me thinking on similar lines - about god, the supernatural and our very own existence. I now realize that most of the answers to PK might lie within that film. As the title of this post suggests, that film is none other than Christopher Nolan’s space epic Interstellar. No, this isn't a spoof post where PK gets into funny situations when he encounters characters from Interstellar. We are getting into some serious adult territory instead. Don’t say I didn't warn you in advance.